This is a Type 23 frigate, one of sixteen new generation lean-crewed warships commissioned by the Royal Navy between 1989 and 2002 for anti-submarine warfare. This top quality model of the Type 23 comes from Flickr’s Luis Pena, who has recreated the very first Type 23 to be built. The HMS Norfolk served with the Royal Navy for 25 years before becoming one of three Type 23 frigates sold to Chile to start a new life in the Chilean Navy. Renamed the Almirante Cochrane the ship carried over the huge array of armaments fitted during its time in the Royal Navy, all of which have been built in miniature by Luis. These include five types of radar, a bow sonar system, a Seawolf anti-air missile system, a Harpoon anti-ship missile system, a Sting Ray anti-submarine torpedo system, six naval and machine guns, two Seagnat decoy systems… oh, and a Cougar SH32 anti-submarine helicopter. It’s a scene that even we’re familiar with; Empire AT-ATs stalking across the snow covered plains of Hoth and towards a Rebel Alliance base soon to be in great peril. Luke Skywalker, commander of Rogue Squadron and famous for some reason, leads the defence in a company of small Snowspeeders. And so goes down one of the most memorable battles in the Star Wars franchise, and one that has been recreated beautifully in micro-scale by Flickr’s GolPlaysWithLego. There’s much more of this stellar build to see at Gol’s photostream via the link, where there are also instructions available so you can recreate your very own Battle of Hoth in miniature at home. Nope, not that Spanish exchange girl from your youth that you always wish you’d kept in touch with, but this rather neat steam corvette sailing under Chilean colours. Built for the Chilean Navy by a British shipyard in the 1850s this Esmeralda is one of several Chilean warships to carry the name, and was sunk in the Battle of Iquique in Chile’s defeat to Peru and Bolivia in 1879. We know so little about about South American conflicts that our narrative ends there, but the model of the lost ship itself is nevertheless beautiful. Flickr’s Luis Peña is the builder behind it and there’s more to see of his gorgeous recreation of the Esmeralda via the link above. We’re a bit nerdy here at The Lego Car Blog, so sometimes we like a good bridge. OK, we’ll show ourselves out, but before we go and have a quite word with ourselves if you suffer from this unfortunate disposition too you can check out of more of Tim Schwalfenberg‘s (brilliant) ‘River Crossing’ at the link. You don’t need a million bricks to build something blog worthy! This tiny tank by Flickr’s GolPlaysWithLego uses just handful of parts and yet looks brilliant in its simplicity. Even more so when it’s comically blowing up another tiny tank in an amusing Worms-esque style. See more at the link! Rat Dude has built this tiny version of the classic 6989 Mega Core Magnetizer. It comes complete with a telescopic grab arm and little rover, just like the original. There’s also a very neat helicopter, featuring some ice-lolly NPU. Being a food item, it was instantly spotted by the TLCB Elves. Click the link at the start of the post and see if you can spot it too. Some things are a lot smaller than you expect them to be. At least that’s what your Mom said to this TLCB Writer the other night. Anyway, this enormous mobile exploration base by Flickr’s Robert Heim isn’t actually enormous at all. In fact the entire front is made out of a mini-figure torso and jet pack mounted upside-down. It’s unclear how said mini-figure astronaut met such a gruesome end, but his remains sure make for a natty-looking lunar rover. More nice parts usage abounds and there’s more to see at Robert’s photostream – click the link above to make the jump. Tagged Lego, Lunar Rover, Micro-scale, sci-fi, Space, The Notorious B.I.G. All the best things arrive in boxes. Fish fingers, LEGO sets, TLCB Elves. OK, maybe not the last one (and cages aren’t really boxes anyway), but pretty much everything else cool in the world will have reached you this way, even if it’s not packaged in a box itself. Enormous container ships like this one are the vehicles that move almost every material good around around the world, without which we’d be stuck with having only what our local economies produce, and we dread to think what that would mean for TLCB Towers. This spectacular Lego container ship by Flickr’s Jussi Koskinen was built as a commissioned piece for an advertisement and it includes over seven hundred 2×4 stud containers, stored both above deck and inside the incredible curved hull. The model totals a huge 112 studs in length and there’s more to see of Jussi’s vessel courtesy of his Flickr photostream. Click the link above to open the box. One of the Seven Wonders of the Modern World, the Panama Canal opened just over 100 years ago, taking over 30 years to complete and costing an estimated 28,000 people their lives. Started by the French in the 1880s, the project was completed by America in 1914, whereupon it completely transformed the worldwide shipping industry. No longer did vessels have to navigate the lengthy and dangerous Cape Horn – the tip of South America – instead able to cut straight through the centre of the Americas. To date almost 1 million ships have passed through the canal, each taking around seven hours to traverse the 77km mix of channels and artificial lakes, and the three huge sets of locks. It’s these locks that are the defining characteristic of the canal, allowing the water and the ships that float upon it to rise and fall with the land in order to cross from one side of the continent to the other. So important is the Panama Canal and the locks that allow it to function that their width and length has become the determining factor for shipbuilding, with ships built specifically to the largest size that is able to fit through them, known as ‘Panamax’. Today though, we have a set of locks that are rather smaller. This wonderful new set comes from LEGO Education, and it recreates the third set of locks of the Panama Canal. Constructed from over 1,180 pieces, the 2000451 El Canal de Panama set is built in five sections (plus a few micro-scale ships), allowing five children (or adults!) to contribute to the finished model simultaneously. Each section contains a set of gears and mechanically operated lock gates, allowing the ‘water’ to rise and fall as the gates are opened and closed. We’ve seen similar mechanisms in paper or card form, but not yet in LEGO, and it seems to work beautifully – making this set a great learning aid for the those wishing to understand both mechanics and hydrodynamics. Originally destined just for sale in Panama, the LEGO Education 2000451 El Canal de Panama set is now available with worldwide shipping (we do hope this means that some sets will travel through the real world counterpart! ), and can be bought via the Panama STEM website. If you’d like to get your hands on this unique limited edition set click on the link below to visit Panama STEM, and you can watch the Lego locks in action on YouTube by clicking here. Many is the time when we sit back in our luxury reclining office chairs at TLCB towers and reflect on how we got to where we are today as some of the world’s leading automotive Lego bloggers and Elf keepers. Perhaps our road to becoming petrol-heads started with wooden toys such these ones built by Jens Ohrndorf? The clean lines of these simple but nicely designed Lego models take us back to the calmer, happier days of our youth. Sadly, we’ve got to disperse of an Elf riot in the photocopying room* but we’ll leave you to click on the link in the text for the bigger picture. 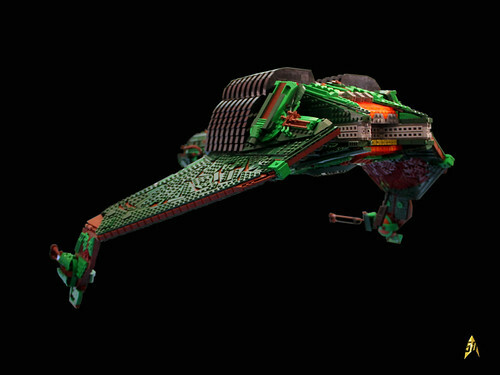 Time to feature another ship on TLCB, only this time it’s of the space-going variety. Birds of Prey usually strike fear into the hearts of TLCB Elves as they roam the highways and byways, searching for Lego models. Quite a few of our workforce have become tasty* snacks for kestrels and buzzards over the years. 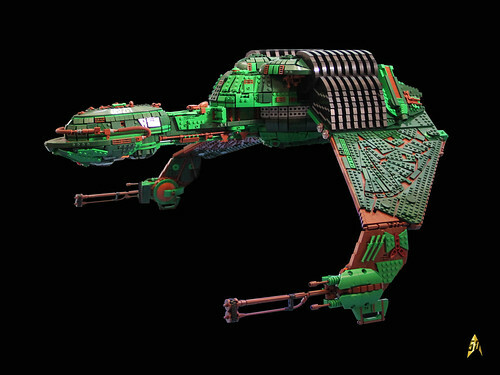 This classic Klingon warship has been built by Kevin J. Walter over a period of 8 years from virtual model to real bricks. It features some impressive and unusual design and detailing which should be interesting to builders of all sorts of Lego MOCs. Click the link in text to zoom into the details on Flickr. Now, can we find something with wheels on to blog in 2017? *Possibly quite chocolaty, given the Elves’ diet of Smarties. You don’t need ten thousand bricks to appear here at The Lego Car Blog. Around sixty will do. At least that’s all Flickr’s František Hajdekr needed to build this lovely Tatra fire truck. See more via the link above. Looking at gonkius’s PhotoStream, we’re pretty sure that he already owns a 42055 Bucket Wheel Excavator. Is one enough? Obviously not, judging by this nice little bit of micro-scale building. Once again proving that it’s not how many bricks you have but what you do with them, our Elves’ tiny minds were instantly attracted to this tiny machine. Readers of a certain age (and this writer), will be whisked straight back to their childhoods by this brilliant Classic Space layout from Primoz Mlakar on Flickr. Promoz has captured in micro-scale the type of image that millions of children looked at in wonder during the early 1980s in catalogues such as this. Click the link in the text to view the individual ships and vehicles and enjoy the nostalgia.